Please contact the owner directly @ 231-250-three two zero four or msuehills(at)gmail(dot)com…This 2005 baja 302 boss has 235 hours on it. Cuddy, closet porta potty, refrigerator, sink, couch, 6 disc cd changer, xm stereo, bolster seats, swim platform, and sun deck, fresh water tank, shore power, and custom canvas, and a triple axle trailer. 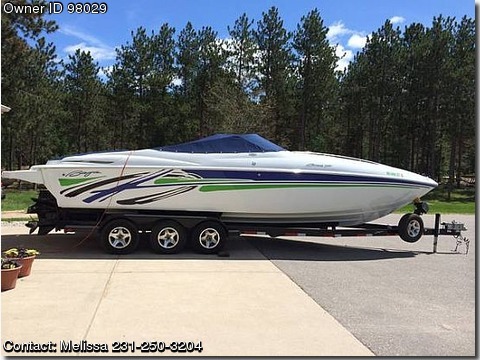 This boat is white with green, blue, and black in gel graphics. It&#39;s a must see to appreciate! !